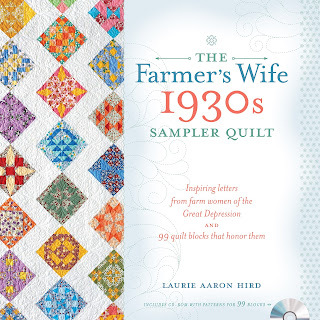 Welcome to The Farmers Wife 1930's Quilt -A-Long. I am sharing my tips and techniques to make block #46 Jewel with you all. I was thrilled to be asked by Angie of GnomeAngel to participate an an official blogger together with Fat Quarter Shop. 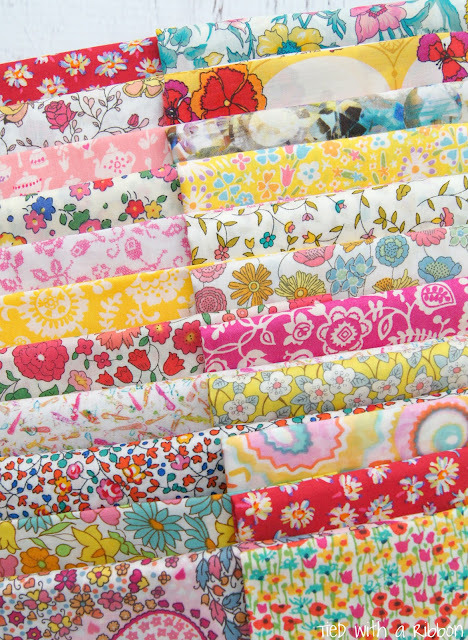 It took me a long time to settle on which fabrics I would use. 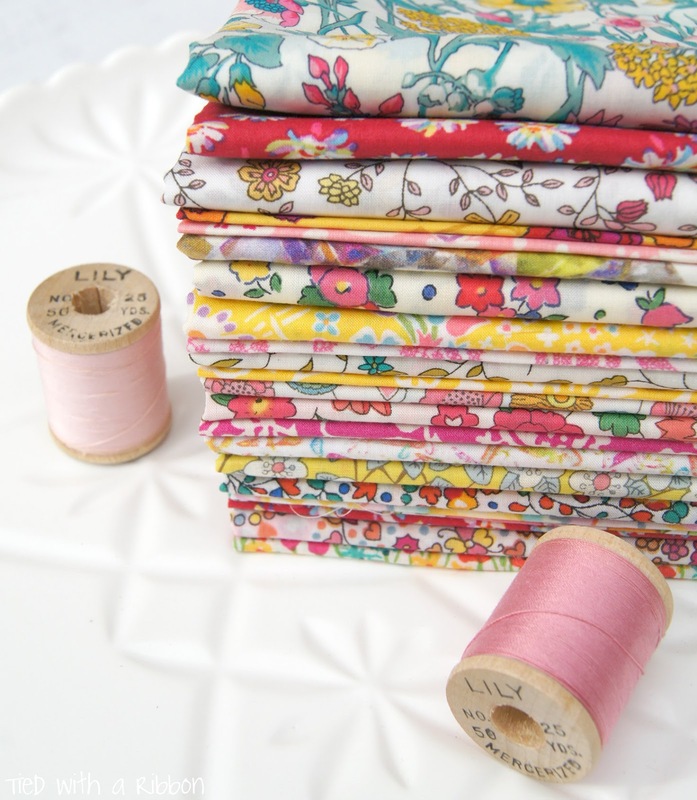 I brought out a few collections like my Cotton and Steel, 1930's Reproductions and a few others but finally settled on some fabrics from my Liberty of London collection inspired by the colours of pink, yellow and red. I love English Paper Piecing (EPP), I love the time taken to hand sew each stitch and how perfectly imperfect each stitch is. 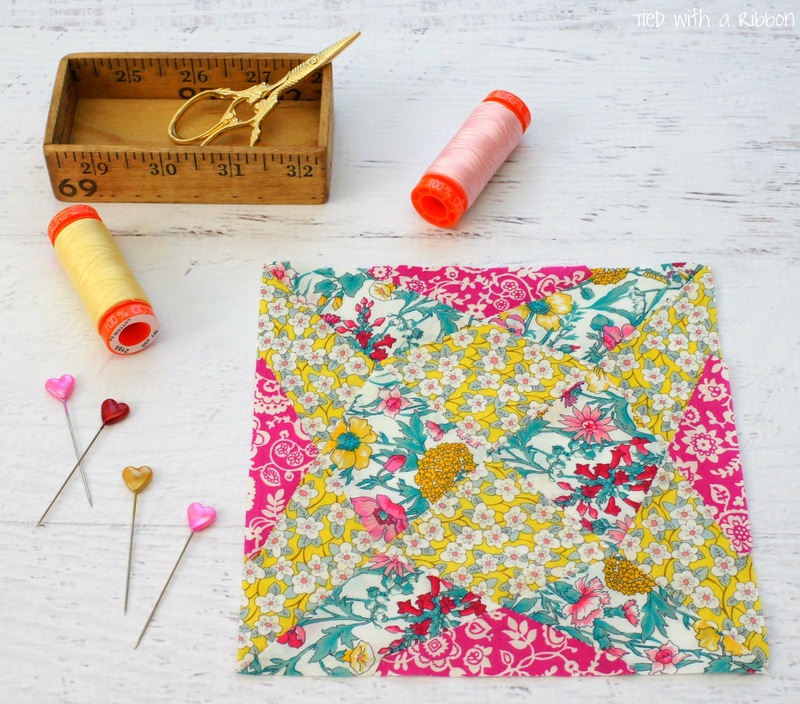 I find it relaxing as well as a great way to take my sewing with me out and about on long car trips, waiting for my girls when they are at activities or just as a way to spend some time winding down. 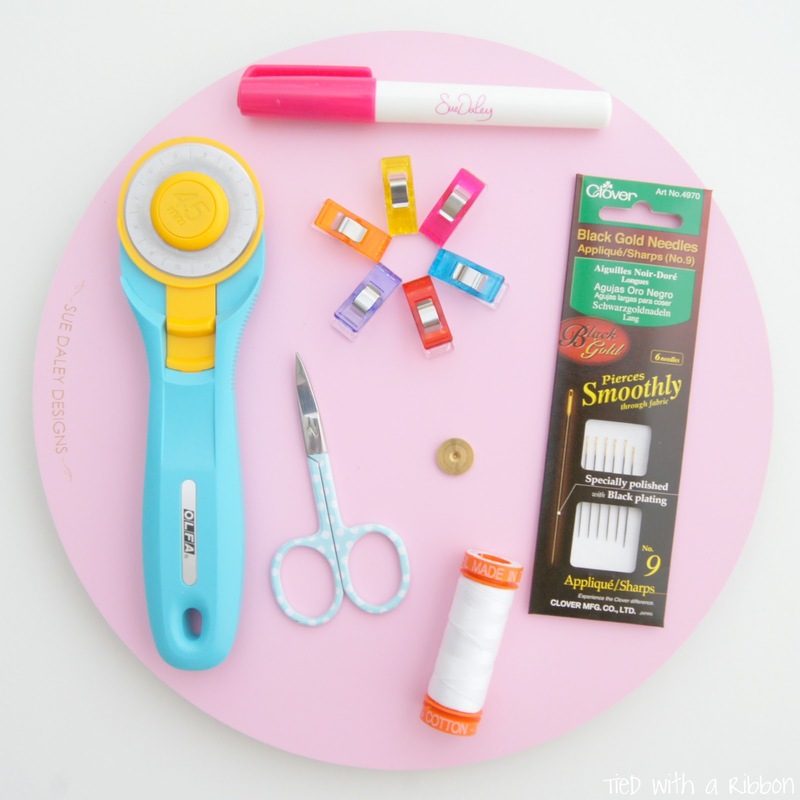 I think that if you are going to spend time hand sewing then make sure you have the right tools and equipment to make the process easier and enjoyable. These are MY favourite Notions and Tools for any EPP project. Thread Basting versus Glue Basting - I really think this is just personal preference. For this block I have chosen to Glue Baste. Invest in good tools and equipment, for example you don't want to have inferior thread snap, break or shred for all the time you spend hand sewing and using needles that glide through your fabric will be much easier. FREEZER PAPER EPP METHOD - For this block I am using Freezer Paper to make my Templates. 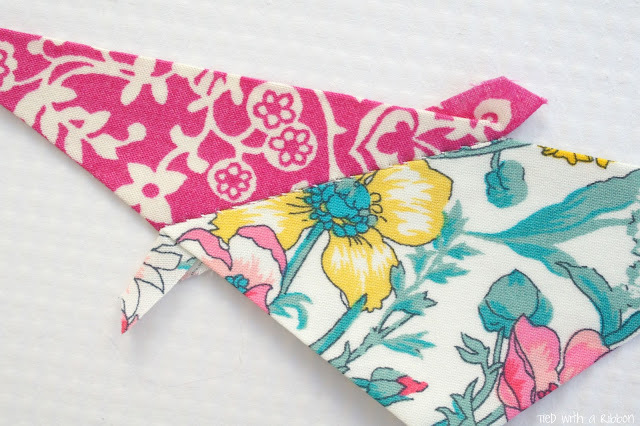 You can of course use regular paper to print out your pattern and use but I hope to show you a technique you may have not seen before for English Paper Piecing. 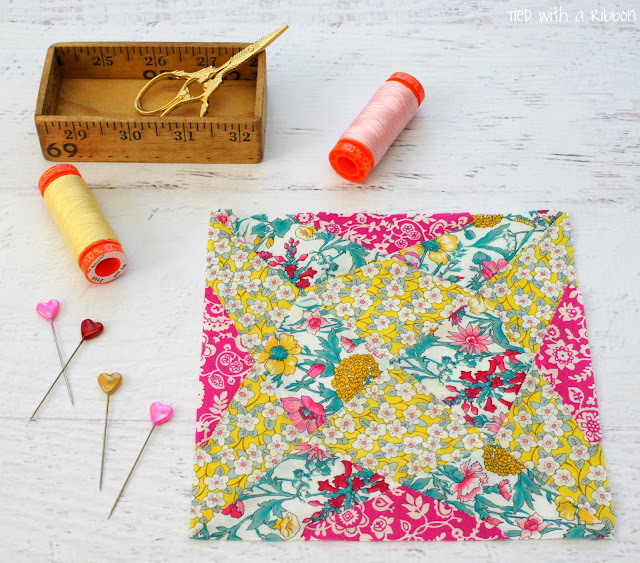 This method makes it easy to keep pieces for each fabric together and stops the paper from moving about while you are basting. Also because you will be dealing with Mirror Image pieces in this block it makes for easy cutting out without having to worry about which pieces to mirror on the fabric and getting muddled up. 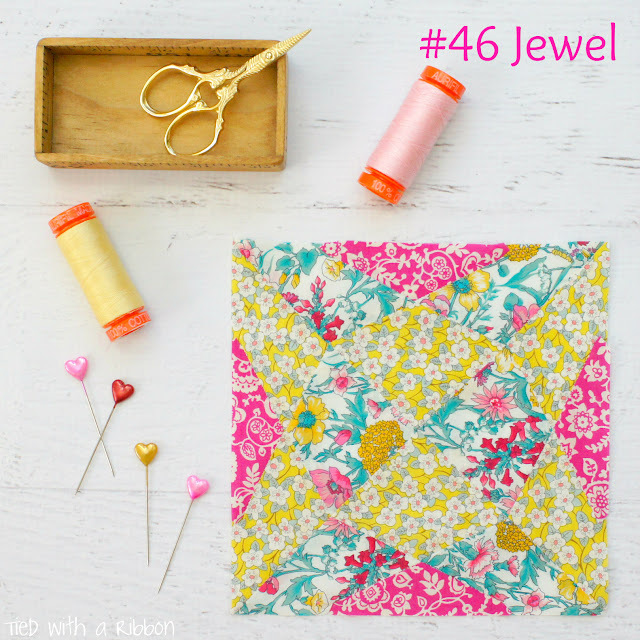 Step 1 - This block does not use common pre-cut paper shapes or templates such as hexagons, diamonds or pentagons like in many English Paper Piecing projects so you will need to make your own Paper Shapes for this block. 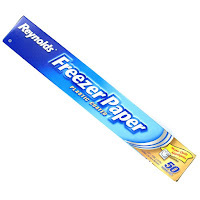 I use Reynolds Freezer Paper and after printing off the Completed Block Template from the CD, trace the entire block carefully onto the paper side of the Freezer Paper using a sharp lead pencil and ruler. 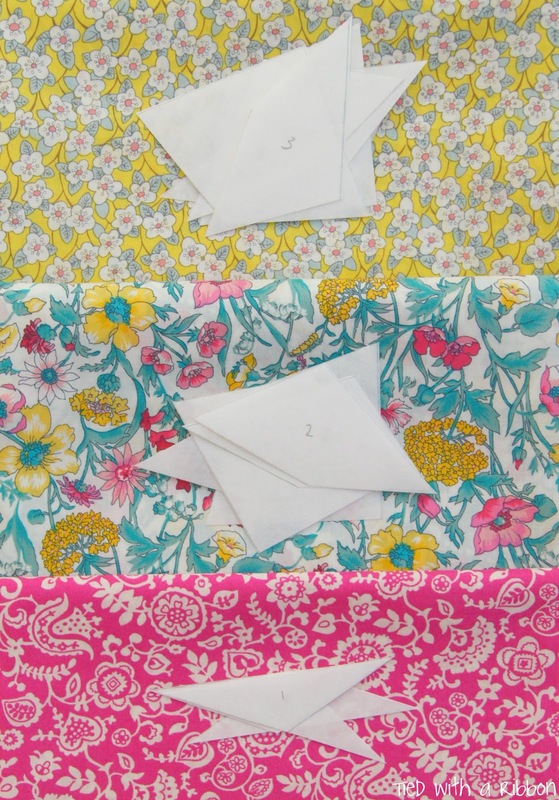 Step 2 - Take your chosen fabrics for each of the pieces and number the pieces on the Freezer Paper pattern according to co-ordinating fabric number - in this block I numbered my Pink fabric 1, Floral fabric 2 and Yellow fabric 3. 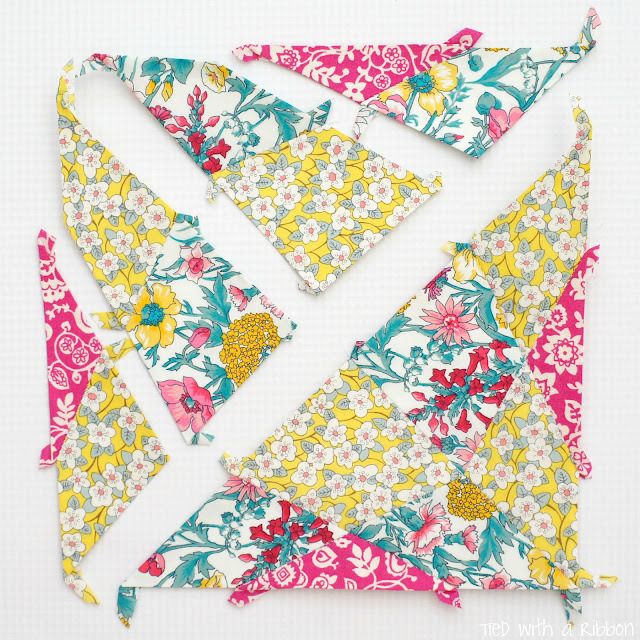 Carefully cut out the Freezer Paper pattern pieces as accurately as possible to make your template shapes for your block. Step 3 - Place the shiny side of the Freezer Paper to the wrong side of the fabric, leaving enough space around each piece to later cut out a 1/4in seam allowance. 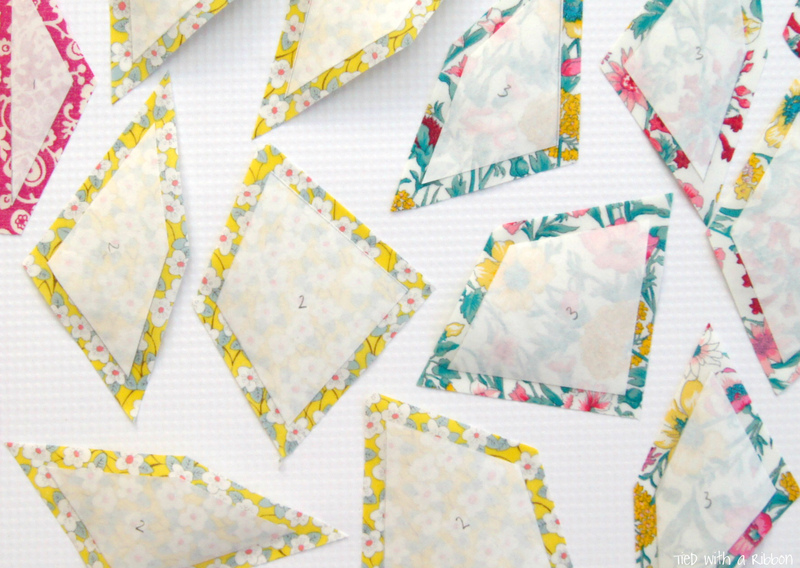 Press the shapes to the back of the Freezer Paper and they "stay" in place on the back of the fabric without moving. Cut out each of the shapes using your Rotating Cutting Mat and Rotary Cutter with a 1/4in seam allowance ready for Glue Basting. Step 4 - Glue Baste your shape using your Glue Pen. Do not trim any "tails" as you move these out of the way of your paper pieces as you sew. Step 5 - To sew your pieces together place them with points/corners matching and right sides facing. Put a Binding Clip at the opposite end to hold the points. Whip Stitch towards your binding clip keeping your stitches just through the fold of the fabric and not lower in the paper (otherwise you will not be able to remove these later). Try to keep your stitches nice and even so that they are less noticeable. Step 6 - Continue to English Paper Piece all the pieces together as shown in the pattern to make the block. Binding clips are also fabulous to help you meet the intersections with the pieces so that everything lines up. Step 7 - Once you have sewn all the pieces together you can carefully remove the papers by lifting the seam allowance from the papers and peeling the Freezer Paper off the back of the fabric. Press the seam allowances back into position to sit flat and Press out, the outside seam allowance to make your block to correct unfinished size. 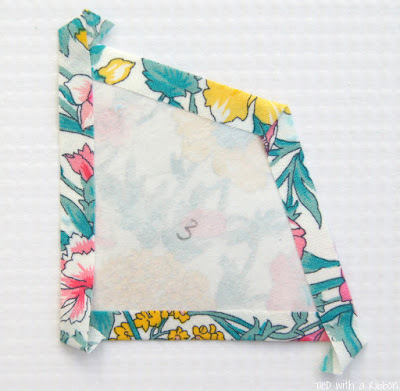 I hope this Freezer Paper technique shows you how easy it is to sew with Mirror Image Pieces in your blocks. 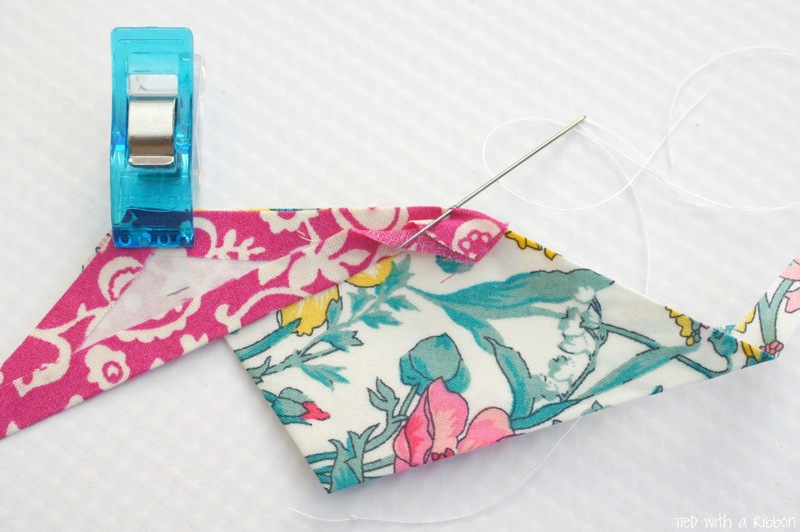 Hand sewing your blocks does take time so enjoy it and the more you do the better and more confidant you will become with this technique. Thank you for this well written, clear and precise tutorial. I think I may just have to try EPP now! Beautiful work, Jemima. I think a Liberty Farmer's Wife will be stunning. 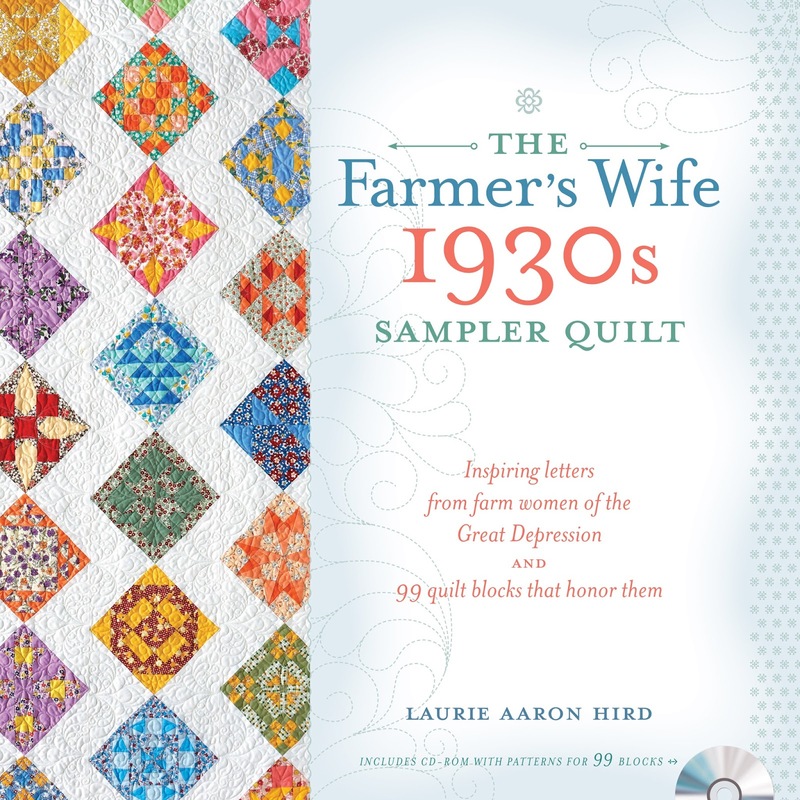 Hi, I just visited your blog because I was looking for your blog on the smitten quilt (which I love!) and I ended up here. I think you choose a wonderful selection of fabrics for your quilt. 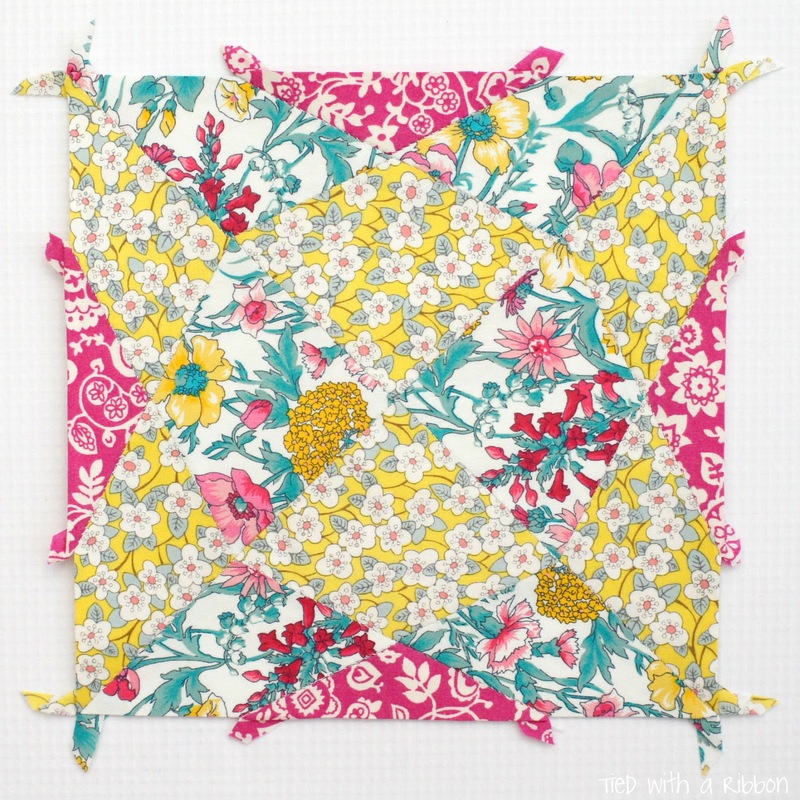 I was just wondering, reading your tutorial on EPP with freezer paper, do you feel the edge of the paper when sewing? Ive just finished a quilt by EPP and I used precut templates. These were quite thick and so it was easy to feel where to sew. 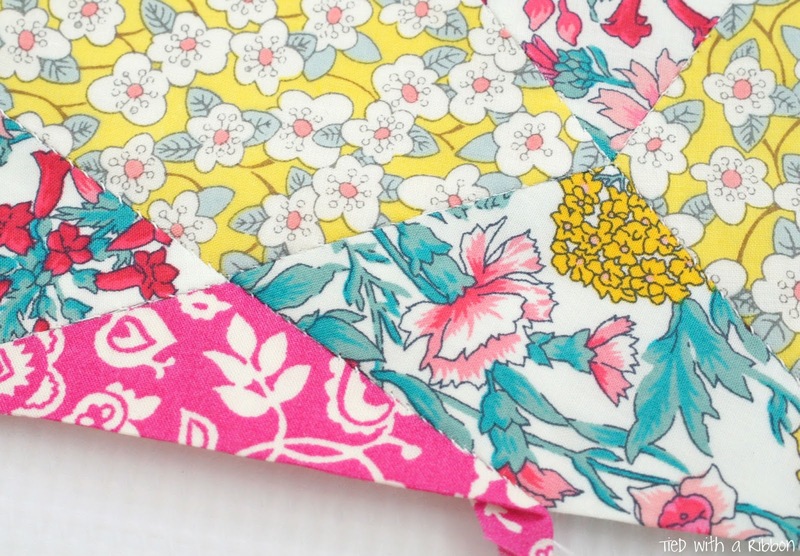 I'd love to try the freezer paper method (it seems very effective! ), but I was just wondering whether it is as clear where the paper stop? Thank you for your wonderful blog! I highly enjoy reading it. Thanks Anne for your lovely comments. The edge of the paper with the Freezer paper is slightly thinner. It is however a great technique when you have to worry about mirror image pieces so you don't get any mixed up. It is not as thick as the pre-cut shapes but I have seen many people work whole quilts with Freezer Paper. Dailylike - a beautiful Online Store.